Mexican-American immigrant women ages 40 to 44 have nearly as many children, on average, as their same-aged counterparts living in Mexico—2.7 versus 2.9. This overall similarity in the fertility of Mexicans in Mexico and Mexican emigrants to the U.S. is notable given the vast differences in the past 50 years in the overall fertility patterns of all women in these two neighboring countries. Back in 1960, the total fertility rate7 for women in their child-bearing years was 7.3 children per woman in Mexico versus 3.6 per woman in the U.S. (all women—not just Mexican immigrants). 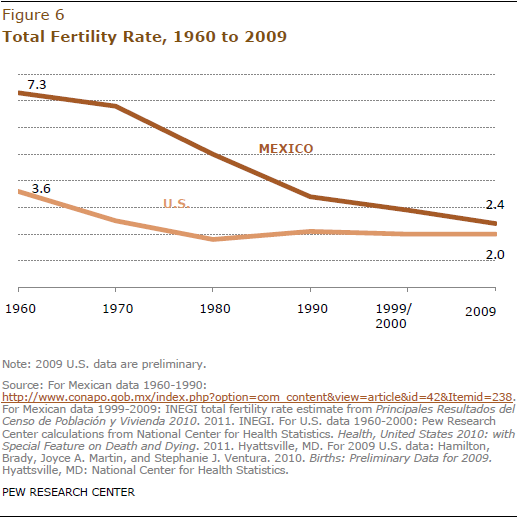 By 2009, the fertility rate in Mexico had fallen to 2.4, while the rate in the U.S. had fallen to 2.0 for all U.S. women. The sharp decline in fertility rates in Mexico in the past half-century is consistent with the demographic changes that often occur when countries undergo periods of rapid economic growth and modernization (Tuiran, Partida, Mojarro and Zuniga, 2002). In addition, changes in Mexico’s population policy in 1974 played an important part in facilitating fertility declines (Partida-Bush, 2005).